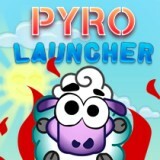 In this game, your main task is to launch a missile or bomb and get into the sheep. You need to release them as soon as possible! Use your mouse, choose the direction and hit the goal! We know that you will do it.